After I had passed the region of fishes, I descended into a pure element-clear as the air in the serenest and most unclouded day, through which, as I passed, I saw the bottom of the watery world, paved with coral and a shining kind of pebbles, which glittered like the sunbeams reflected on a glass. I longed to tread the delightful paths, and never felt more exquisite delight, than when the machine I was enclosed in grazed upon it. On looking through the little windows of my prison, I saw large streets and squares on every side, ornamented with huge pyramids of crystal, not inferior in brightness to the finest diamonds; and the most beautiful buildings--not of stone, nor brick, but of mother of pearl, and embossed in various figures with shells of all colours. The passage which led to one of these magnificent apartments being open, I endeavoured with my whole strength to move my enclosure towards it, which I did, though with great difficulty, and very slowly. At last, however, I got entrance into a very spacious room, in the midst of which stood a large amber table, with several chairs round the same. The floor of it was composed of rough diamonds, topazes, emeralds, rubies, and pearls. Here I doubted not but to make my voyage as profitable as it was pleasant, for could I have brought with me but a few of these, they would have been of more value than all we could hope for in a thousand wrecks; but they were so closely wedged in, and so strongly cemented by time, that they were not to be unfastened. I saw several chains, carcanets, and rings, of all manner of precious stones, finely cut, and set after our manner, which, I suppose, had been the prize of the winds and waves. These were hanging loosely on the jasper walls, by strings made of rushes, which I might easily have taken down; but as I had edged myself within half a foot of them, I was unfortunately drawn back, through your want of line. In my return I met several comely mermen and beautiful mermaids, the inhabitants of this blissful realm, swiftly descending towards it, but they seemed frighted at my appearance, and glided at a distance from me, taking me, no doubt, for some monstrous and new created species. Here he ended his account of his mermaid adventure, but grew so melancholy, and so much enamoured of those regions he had visited, that he quite lost all relish for earthly pleasures, till continual pinings deprived him of his life; having no hope of ever descending there again, all design of prosecuting the diving project being soon after laid aside. Notice the typical ending of this mermaid adventure: the man who encountered the mermaids dies soon after. The text says that he pined away - in other words he was so sad that he could never return that he finally died of sadness. 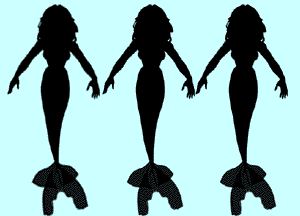 The mermaid adventure is a meeting with the transcendent, something outside of our ordinary world. It is like comparing Oz to Kansas. Once you have been in the Technicolor world of Oz how can you return to gray Kansas?